Nestled on the coast of the Yucatan Peninsula, Secrets Maroma Beach Riviera Cancun is located on one of the most pristine white sand beaches in all of Mexico. This adults-only (18+) luxury oasis is situated between 500 plus acres of stunning unspoiled beach and lush rain forest. Experience Unlimited-Luxury® at this AAA Four Diamond rated all-suite resort that boasts 412 suites surrounded by 14 meandering pools, an amazing spa and spa gardens and enough entertainment, sightseeing, sports and recreational opportunities to fill every waking hour. 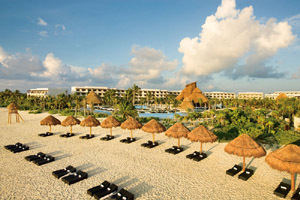 Secrets Maroma Beach Riviera Cancun offers adults an extra measure of romance and sensuality in exquisite luxury settings. Immerse yourself in Unlimited-Luxury® , where everything is included: Elegantly appointed rooms and suites with 24-hour concierge and room services. Multiple gourmet restaurants and lounges serving premium beverages. Endless day and evening activities, all in a spectacular setting. Unlimited-Luxury®... A new and better way for adults to have it all. 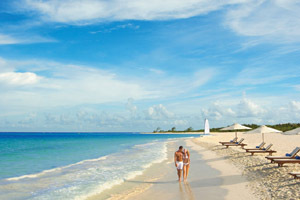 Secrets Maroma is situated on the coast of the Yucatan Peninsula and lies a mere 30 miles south of Cancun. Located 20 miles south of Cancun International Airport, this all-suite haven is surrounded by vibrant coral reefs, soft white sand and adventurous attractions. As part of the privileges of Unlimited-Luxury®, we're offering guests of Secrets Maroma Beach Riviera Cancun the chance to Sip, Savor & See all AMResorts properties in the region. Enjoy dinner and live entertainment at neighboring resorts including sipping complimentary cocktails, savoring delicious cuisine at the restaurant of your choice and the opportunity to see that evening's entertainment. This package is complimentary when booking a minimum of 5 nights in Preferred Club Junior Suite Ocean View or higher room category. 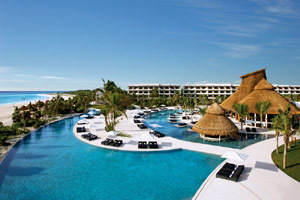 Secrets Maroma Beach is a Rainforest Alliance Certified Hotel! The Rainforest Alliance is a leader in sustainable travel, promoting tourism certification as a tool for conservation and the economic development of local communities and businesses. The Rainforest Alliance helped to establish an accreditation body -- the Global Sustainable Tourism Council (GTSC) -- to help tourism certification programs around the world develop and implement environmentally and socially sound standards. Secrets Maroma Beach Riviera Cancun now welcomes small dogs (under 22 lbs. or 10 kg) in their accommodations and on property. This service is available for $75 USD per night in the required room category. Please contact the resort directly to confirm necessary room category. To reserve a room for a guest with a dog, please email info.semrc@secretsresorts.com. To check availability, you can contact reservations before booking. For full details and restrictions, please visit Secrets Maroma Beach Riviera Cancun’s accommodations page.